It’s Monday night and I really should be getting ready for bed, but instead I’m sitting on my couch attempting to write a worthwhile webpage post about the last few days. Unfortunately I just haven’t been able to find enough energy to keep my blog updated lately. Not that I’ve had much free time to even consider writing with my ridiculous work commitments recently, but I was hoping that having a long weekend away from the office would finally help me churn out a few entries. 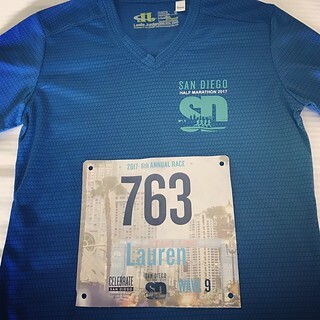 (Often I mentally compose posts at completely inopportune times to document them – like while I was running the San Diego half marathon yesterday – so many of my brilliant ideas are lost forever.) I did spend some quality time with my laptop this weekend, but nothing much came of it. I think my brain was just too weary after the last few weeks to be able to formulate more than the few coherent sentences you’re reading right now. And they took longer to write than I’d like to admit. I haven’t slept enough in quite a while and I’ve been on the go for far too long now. Luckily I have a little bit of a break coming on the work front, but with the LA Marathon next Sunday morning I still have important fitness obligations I have to fulfill this week. (Of course today all I did was go to Disneyland with my friend and her daughter, even 5 hours of walking was a break for my aching knee after the race yesterday.) I am in serious need of some time to relax. I have a plan so we’ll see if I’m able to execute it this week. If I am successful I’ll be able to let you know how it goes in a new webpage post soon!